Each week or so I post a readable or watchable and/or a listenable of which I'm fond. You can choose what happens after my recommendation. Ignore, embrace, debate. Earlier volumes of The Rabbit Recommends can be found here. Dave Ramsey, Suze Orman and the Holy Spirit combined their efforts to convince me to spend less money. On anything. I evaluated my monthly expenses by carefully reviewing the Chick-Fil-A and Starbucks and Arby's receipts populating my handbag. The budget item of excess was clear. I asked mah internets how to make the cable bill bend to my will and the answer was "Roku." Roku is a streaming player that connects to your TV and Wi-Fi network. Then, you can access existing subscriptions like Netflix, Amazon On Demand, HuluPlus, and more sassy channels. I compared this device to Apple TV, Blu-ray players, gaming consoles, and other devices and the internet kept chanting "Roku." So I canceled my cable and this lil' gadget moved in. I'm hooked. CNET recently named Roku as one of the best gifts for under $50. Here's a 3-minute recap of highlights. 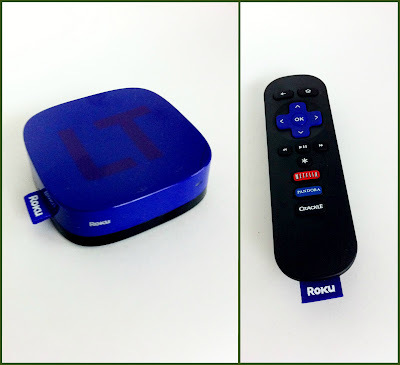 I love Roku and I want you to love it too, so I'm giving away a Roku LT ($49.99) to one lucky Rabbit reader. Name a must-see TV show. Each of the following will give you 1 extra entry. Make sure to leave a separate comment for each, whether you're doing it for the first time or you've already been there, done that. Important Details: Open to anyone 18 or older in the US or Canada. Must enter before 11:59pm CST on Monday, January 30 to qualify. Winner will be chosen randomly using Research Randomizer and announced next week. Note: Although Roku and I are in a committed relationship, the makers of this wonder don't know the first thing about this blog or this giveaway. Sponsored by yours truly.